Who’s Interested In our CPR Classes and First Aid Training? 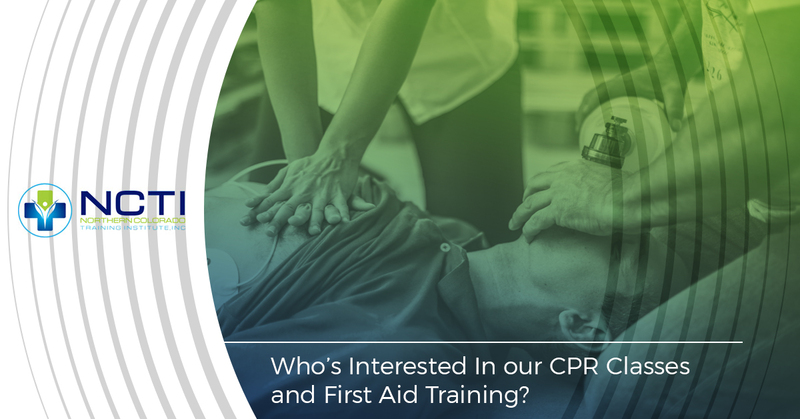 Why are you interested in CPR training with NCTI? The fact is, the person who’s in your CPR class with you might not be there for the same reason you are, though the end result is the same: you’ll both be better trained in how to save a life. In our time training people in CPR and first aid, we’re run across many reasons why people take our classes. Here are the most common. There’s no doubt that most of the people who are interested in CPR certification are taking the classes because they are in the medical field. Some are interested in our CPR and first aid classes as a first step in the medical field, while others are here for recertification of their training. We also have CNA courses for those who are interested in being a certified nursing assistant, and CPR training is a necessity. Most people don’t realize that being a daycare worker requires CPR training, and we think that’s a pretty good idea. Not only can we teach you proper adult and child CPR, but we’ll also be able to train you in the proper way to perform infant CPR. It’s also just good business for a daycare center to be able to claim that they have as many CPR-certified caregivers as possible. Being a new parent can be a scary time. What’s normal for a child to do? How much should you avoid your child coming in contact with germs, and how much is healthy for the immune system. While some parents can be overprotective of their children in some ways, infant CPR isn’t one of them. All parents should be trained in infant and child CPR so that they can save their children — or someone else’s’ — should it be necessary. Colorado is an amazing place for adventures, with so much hiking, skiing, biking, and rafting to do. But sometimes stuff goes wrong, and it’s a good idea to have someone nearby who has first aid training to able to deal with those mishaps. That why it’s a good idea for people who are working in the tourism industry — whether they’re saving someone from drowning during a rafting trip or tending to someone who got hit by a ski chair — to have the proper training to help those who might be injured. If someone doesn’t fall into one of the above categories, the person in your CPR class might just want to be someone who’s ready for something to wrong. Perhaps they were recently in a car accident and weren’t able to provide the care they wish they could have. Maybe their personality just makes them want to help people whenever they can. Maybe they want to be prepared for the collapse of society! Either way, we’re happy to teach them how to help someone in an emergency. Get Your CPR Class and First Aid Training Schedule! No matter why they’re here, we’re happy to teach every one of our students what they need to know to provide CPR and first aid care. When you’re ready to move forward with your training and be ready to save a life, click here to contact us and find out about our scheduled classes.